We’ve replaced a lot of the benefits of having a traditional office with online apps. Here are the ones we use daily. I never like to get caught up on tools. I think it’s far too easy to spend too much time thinking about which tool is better, when a better use of your time would be to pick any tool and move on to the hard work of using the tool. With that said, the best tools can add tremendous value. So today, I’m sharing the 18 tools that our remote team uses every single day. If you’re looking for new tools to fill any gaps in your own stack, I hope that this list helps. Note: We first published this list in 2015, and I’m updating it to include the new tools we’ve started using since then, and removing the tools we’ve dropped. Even a remote company needs a headquarters, and for us, that HQ is Slack, a team chat app. 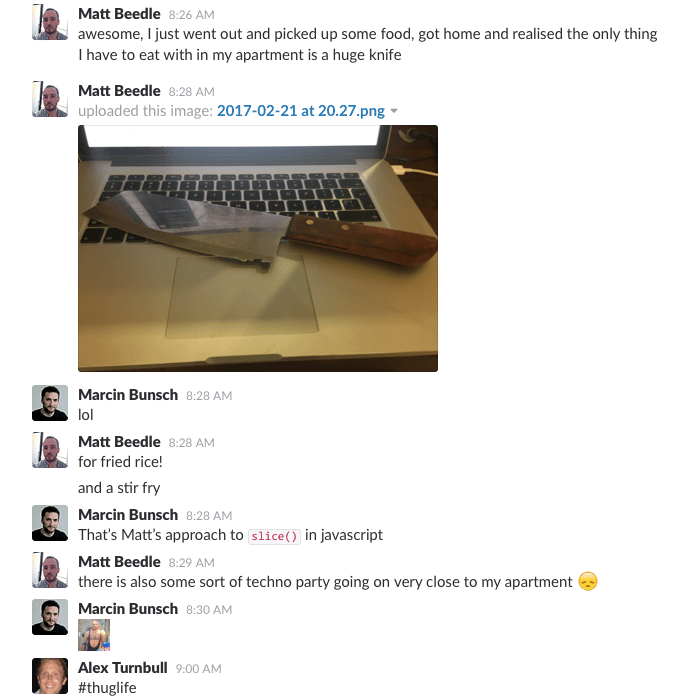 We use Slack to brainstorm, ask each other questions, pass files back and forth, compare notes on new releases, and much more. Slack also serves as our virtual water cooler, giving our team a place to talk about anything, work-related or not, or even let off some steam. A few years ago, we were looking for a good app that would let us do voice calls and easily share screens at the same time, a burden that seemed to slow Skype down too much to make it usable. We wanted something as simple to use and as pretty as Slack. Originally, we found that solution in Screenhero, which was going pretty well until Slack decided to buy them. After the acquisition, the app wasn’t supported as well as it was before, and a few annoying bugs went unfixed for some time, so we dropped it and began searching for something else. I’m glad that we did, because we soon found Zoom, which has been stable, smooth and pretty pain-free for us (more so than Slack’s recently released video call feature, presumably built on Screenhero). We use Zoom for our daily team meetings, as well as one-off calls that pop up throughout the day. It has replaced Screenhero, Skype and Join.me for us. …and assign tickets to other people on the team. 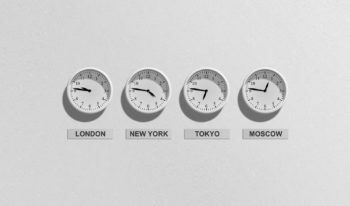 With a team scattered throughout the world, scheduling calls and collaboration sessions across time zones isn’t the easiest thing. I love World Time Buddy for that reason: it makes it really easy to enter a few time zones and find some overlapping times. 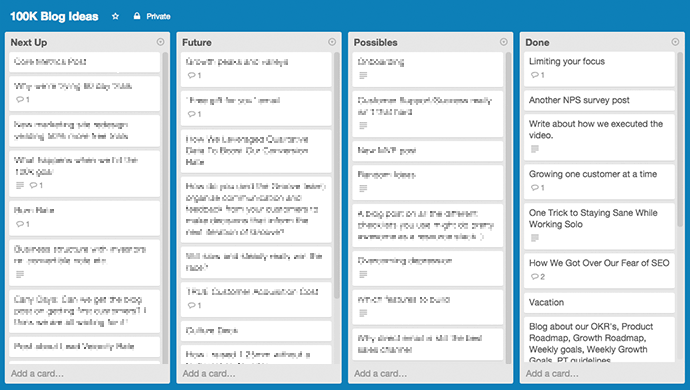 Out of a half dozen project management tools that we’ve tried, Trello has been our favorite by far, and we’ve stuck it with for several years now. Simply put, it keeps things from slipping through the cracks. Examples: Marketing, Customer Support, etc. 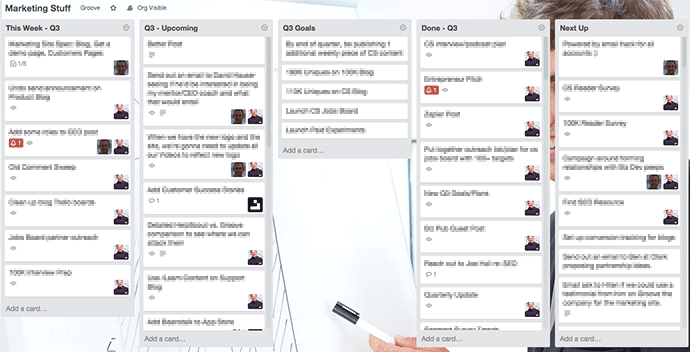 The team Trello boards are where we put weekly and upcoming to‑do’s, as well as quarterly goals (as well as stash ideas for the following quarter). Every Monday, team leaders (or team members) pull to‑do cards from Upcoming (and from our project boards) to This Week, so a team member’s respective board (or their team’s board) is the only board that they need to check on a day-to-day basis to see what they should be doing. The project boards are where we track ongoing efforts like the blogs. We use them to brainstorm ideas and build our version of an editorial calendar. These boards aren’t meant to be immediately actionable (e.g., you shouldn’t be checking these boards to see what to do next), but are meant to update when you make progress on something, or to grab to‑do’s from for the coming week. I’ve seen dozens of ways to organize Trello boards from others who use the app, but this is what’s worked best for us so far. 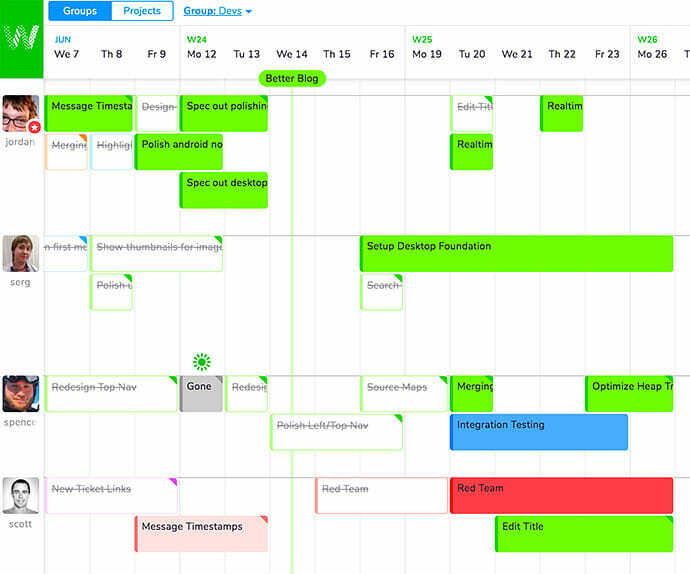 We use Teamweek to plan our two-week sprints across the entire team, making it easy to see exactly what everyone is working on on a given day. With three blogs, guest posts and thousands of emails going out each year, we have a lot of content to keep track of. We use Google Drive as a repository for all of it; inherently collaborative, easily organizable and instantly searchable, it’s the best tool we’ve found for managing content. And with Google behind it, I have a reasonable level of confidence that our critical files won’t get lost (though we do back things up anyway). And with practically unlimited storage, it has replaced Dropbox for us as well. As we all have different hobbies, interests and remote strengths and weaknesses, we all have our own favorite tools for staying sane working solo. 9) Alex: What good is living across the street from the beach if you can’t enjoy it? I love Surfline and Magic Seaweed for surf reports to let me know when it’s time to take a break and grab my board. 10) Len: Headspace is awesome for anyone that has trouble disconnecting. It’s a guided meditation app that, in 10-20 minutes a day, helps you clear your head and get back to work with renewed focus. 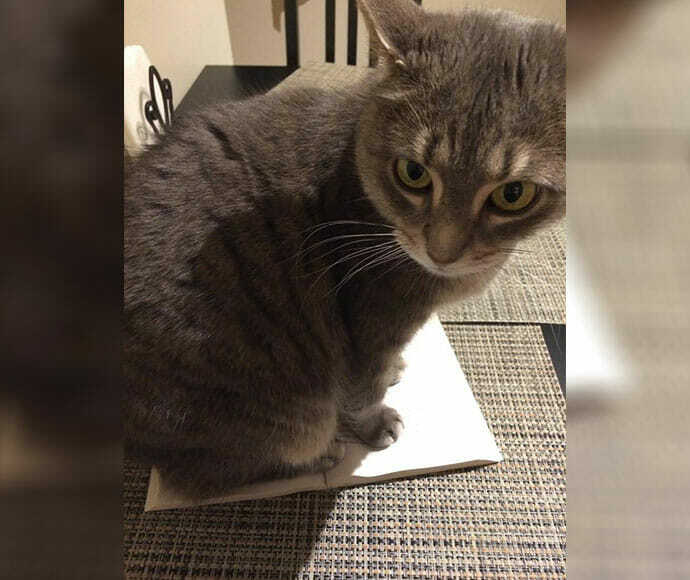 Also, while not a traditional “tool”, our cat Zoe has a helpful built-in feature that tells you when it’s time to step away from your work for a bit. 11) Jordan: These days I’ve moved much of my process to pen and paper. Starting each day writing the date and my top 4-5 tasks to finish. When I need a quick distraction it’s always on mobile, usually Robinhood or StockTwits. 12) Serg: I love Org-mode. It’s a task manager meets journal meets personal assistant kind of thing: it lets me get rid of that feeling when you know you wanted to do something or think about something, but don’t quite remember exactly what that was. It’s pretty close to OmniFocus or Wunderlist the way I use it, but it’s a much more open and flexible system. And when I’m on the go, I use Orgzly. 13) Matt: I use Vitamin-R to break my work time into 25 minute chunks with 5 minute breaks to stand up. It has a built-in noise machine for pink noise. Bulletproof Coffee Brain Oil for focus and SWORKIT for home workouts. Those are my essentials. 14) Lesley: One of my favorites is an app called Take a Break, Please that forces me to get away from my desk and actually move throughout the day. Without it I used to just sit for hours and hours at a time, and sometimes even forget to eat lunch, which is just the worst thing you can do. 15) Elen: I tend to get hopelessly lost in certain tasks—when I finally come out of the cave it’s five years later and I’ve worn myself out to the point of my brain not working anymore. Toggl helps with that when it comes to both work and personal projects. It’s a super easy to use time tracker that keeps me aware of how much time I spend on different tasks and nudges me to take a break every now and then. It also has great reporting features, so at the end of each week I can easily identify my biggest time sinks and plan my future schedule accordingly. 16) Jared: Bartender groups and organizes my menu bar, hiding the clutter of 1,000 applications all staring back at me from the top corner of my screen. And when I need to take a break for a few minutes, I open up Ableton and and work on a few bars of whatever music comes to my mind. It’s an entirely different creative outlet than my normal day, which helps to quick reset my brain. 17) Glenn: I use the Snooze button in Slack, for when I need to focus and not be distracted by funny cat gifs in #water-cooler. I use Giphy to post distracting funny cat gifs in #water-cooler. I use Tomighty which is a free Pomodoro timer to remind me to take a break and stretch my legs. I also love my Autonomous.ai standing desk. 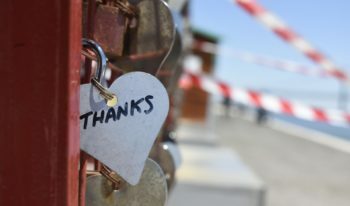 I hope that this post has given you some ideas for tools that can help your team be more productive, effective and close-knit. I’d love to hear more about what tools you find to be most useful on your own team. Share your favorites in the comments!